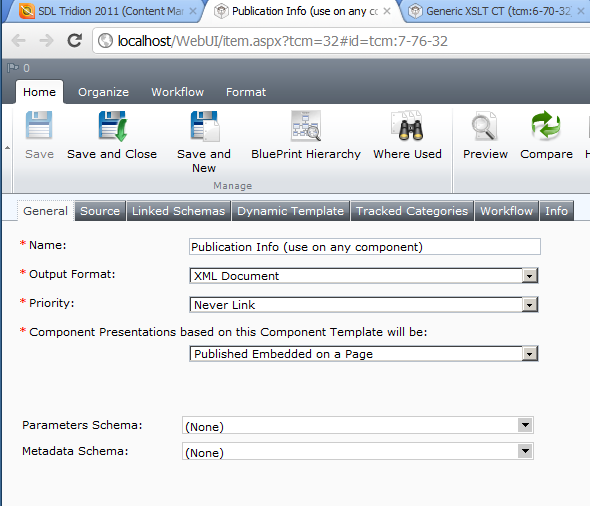 Ever need in-depth publication information from within your content management explorer (CME aka Tridion's GUI)? Curious about what XSLT can do for you? I was hoping to make a every-example XSLT training component template (CT) with examples and everything you'd ever want to know about XSLT with Tridion, but I'll have to pace myself and settle for the following. 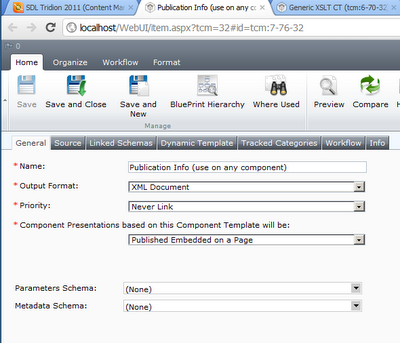 See below on how to make an XSLT CT "inpsector" template. Preview it with any component to get publication details in a recursively-drawn HTML table. Call it something like: "Publication Info (use on any component)"
<xsl:value-of select="local-name(.)" />="<xsl:value-of select="." />"
Right-click on the template in a publication that has components and preview any component to see the publication information. Optionally set a specific schema as a linked schema (Linked Schema tab in the XSLT CT) to allow the preview to start from the components based on that schema. Tridion has a lot of hooks including the new GUI extensions for the 2011 platform, but a "quick and dirty" yet still somewhat elegant solution to getting data, reports, or other information out of the CMS is through templates such as this one. Consider developing your own similar XSL (or other templating language) "utility templates" as starter examples or to pull data in the format you need within the CME. I'd love to see other shortcuts and utility templates you've made to inspect content, get categories and keywords, or otherwise create simple reports using preview or possibly publishing. Happy template building! (20-Dec-2011) Update: made code prettier.